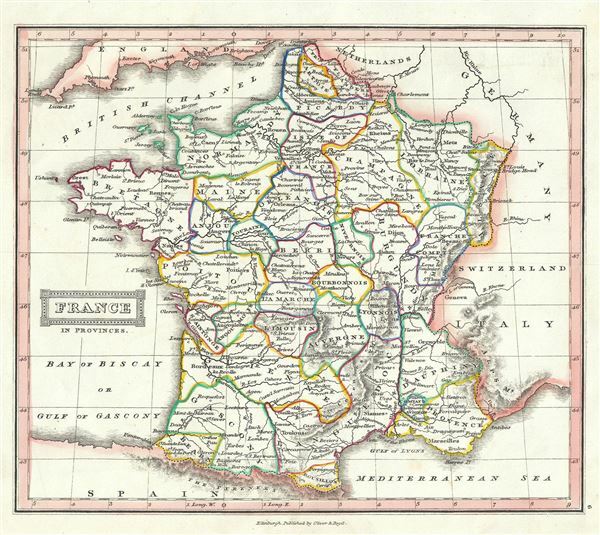 This is a lovely example of Thomas Ewing's 1845 map of France. The map covers the Kingdom of France showing its various divisions according to province. It covers from the Flanders in the north to Roussillon in the south and from Brittany in the west to Alsace in the east. Throughout, the map identifies various cities, towns, rivers, lakes, roadways, railways and an assortment of additional topographical details. This time in French history marked the rule of the July Monarchy, a liberal constitutional monarchy under King Louis-Philippe. The July Monarchy would last until the Revolution of 1848 and ultimately lead to the establishment of the Second Republic. In less than a year after the December 2, 1851 coup d'etat, the Second Republic transformed into the Second Empire, established by a referendum on November 7, 1852. President Louis-Napoleon Bonaparte, elected by the heavily Bonapartist French people, officially became Napoleon III, Emperor of the French, from the symbolic and historic date of December 2, 1852.